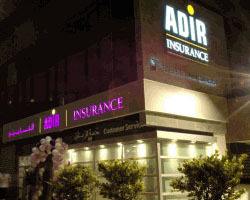 ADIR Insurance is backed by two prominent shareholders, Byblos Bank and Natixis Assurances – France. Byblos Bank is one of Lebanon’s most prosperous banks. It boasts one of the largest and far reaching domestic branch networks. It is also present in twelve countries spread accross the Middle East, Europe, and Africa. In all these countries, the bank is committed to adhering to international standards of corporate governance, customer satisfaction, and quality service, and it pushes for business growth, while supporting social and economic development. Byblos Bank provides full-fledged consumer banking, commercial banking, correspondent banking, and capital markets services to an ever-growing clientele, both locally and internationally. Natixis is the corporate banking, investment management, insurance and financial services arm of Groupe BPCE, which is the second largest banking group in France. As one of France’s largest bancassurers, the company provides an extensive range of insurance products and services, comprising Life Insurance, Personal Risk Insurance, as well as Property and Casualty Insurance solutions for individuals, companies, and non-profit organizations. These solutions are primarily distributed through Banque Populaire and Caisse d’Epargne, two of France’s leading cooperative retail banking networks.